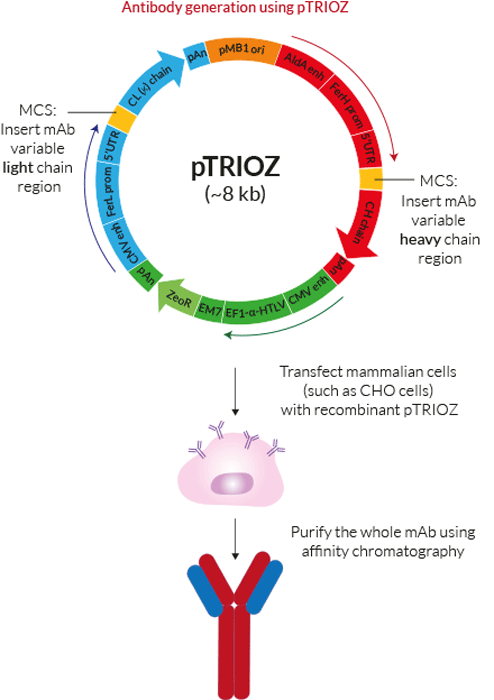 The pTRIOZ collection has been designed specifically for high-yield production of whole recombinant monoclonal antibodies (mAbs). For successful mAb production, a precise expression ratio of the heavy to light chain is required. In the pTRIOZ plasmids this important ratio is under the control of the human ferritin heavy (FerH) and light (FerL) chain promoters, which natively drive the successful co-expression of the two ferritin subunits. They are in combination with unique enhancers to form composite promoter regions, ensuring optimal expression of both the heavy and light chains. InvivoGen offers the 4 most popular human and murine IgG isotypes used in mAb production, optimized to ensure maximum production. All pTRIOZ express the constant kappa light chain region, either human or murine. 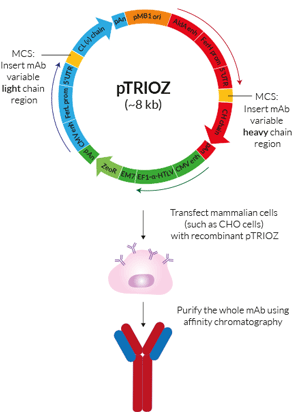 pTRIOZ is utilized in-house to produce InvivoGen’s expanding mAb collection.